By local tradition, the Richmond RSL Sub-branch will commemorate ANZAC Day 2019 with a veteran’s march through Richmond Township and a wreath-laying ceremony at the Richmond War Memorial, from 2.30pm on Sunday 14th April; and, a Dawn Service, at the Richmond War Memorial, at 5am on Thursday 25th April. Ahead of the commemoration on Sunday 14th April, Richmond RSL Sub-branch will also pay homage to the District’s past and serving defence personnel with an ANZAC Day church service to be held at St Monica’s Catholic Church at 9:30am and, thereafter, with a ‘reflection’ at the RAAF Cemetery. All welcome. The Richmond RSL Sub-branch strongly encourages the descendants of veterans to join in the march, by contacting the Richmond RSL Sub-branch Secretary on 0438 782 419. Richmond RSL Sub-branch Vice President, Don Bartlett, welcomes the many veteran and community groups who, each year, lay wreaths on behalf of their veteran communities. The Sub-branch’s members also appreciate those community members who lay private wreaths on the Memorial in honour of their own family members who have served, or are serving. Preparations for ANZAC Day 2019 are moving ahead to ensure the continuing participation of local community groups and the selection of keynote speakers. Richmond RSL Sub-branch has recently refurbished its war veteran’s museum, and looks forward to sharing its ‘treasures’ with the local community. The museum is also open to local community members between 10am and noon, each Tuesday and Friday. • Dawn Service will be conducted by Windsor RSL Sub-branch at the Windsor War Memorial from 5:30am (for 5:50am). • ANZAC Day will be commemorated at the Wilberforce War Memorial at 9am. For further additional information, contact the Richmond RSL Sub-branch Secretary, Gillian Fletcher on 0438 782 419 or Publicity Officer, Lynette Bowles, on 4578-2804. The March commences at 24 West Market Street at 2.30 pm, with a Commemorative Service to follow at Richmond War Memorial , East Market Street. Members of the public who are a descendant of a former Veteran, of any conflict, are also invited to participate in the March wearing the medals of their Veteran, and/or carrying a photo or displaying the name of their Veteran. Following the Commemorative Service, members of the public are invited back to the Richmond RSL Sub-Branch for light refreshments. The community is invited to join members of Richmond RSL Sub-branch in solemn observation of the Dawn Service at 4:45am for a 5am start at the Richmond War Memorial in Richmond Park. The Lions Club will be providing members of the public breakfast, at a small cost (gold coin donation), following the Service. ANZAC Sunday services will be held early this year because of Easter. The first scheduled service will be held at the Centenary of ANZAC Reserve, Wrights Rd, Kellyville (Opposite Kellyville Plaza) this Sunday, April 14. Guests are asked to gather at 8.30am as the march will start at 8.50am. Guest Speaker will be Rear Admiral Michael Rothwell AM RAN. Also speaking will be the four high school ANZAC ambassadors, Rebecca Hinton from Marian College; Ethan Wynne from Pacific Hills, Jake Christian from Crestwood High and Elizabeth Rodd from William Clarke College. Parking available at William Clarke College, and streets around the Centenary of ANZAC Reserve. There will be no parking in Harrington Rd. 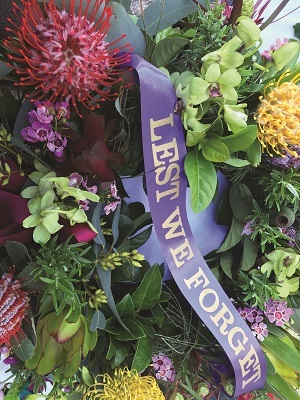 Any organisation wanting to lay a wreath, please register by sending your request to ceoassist@chrslgroup.com.au. Only those registered will be announced and called to lay a wreath. If you would like to lay a wreath and do not registered, then you may do so but you will not be announced. Maximum of two people per wreath. There will be a display of historic Military vehicles including a Centurion tank for you to view after the service. GALSTON The ANZAC Sunday service at Galston will begin at 2pm at the Galston Cenotaph on April 14. The march will be led by veterans following the Hills District Pipe Bands . Federal Member Juian Leeser will give the address. Commander Paul Garai RAN (pictured) will give the ANZAC Day address at the Dawn Service at Castle Hill. The ANZAC Sunday service will be held at Centenary of ANZAC Reserve, Wrights Rd, Kellyville starting at 6am but people are urged to arrive much earlier. Commander Garai joined the Royal Australian Navy after leaving high school nearly 30 years ago. “Anzac Day is about coming together as a community to recognise the women and men who have served and still serve. Many in my family have military service, which makes it a very personal day as well,” he said. His Anzac Day address will cover the importance of appreciating those who have served, and given up so many normal things that are mostly taken for granted, such as family, freedoms and safety. “There is not much that compensates for those sacrifices, but the appreciation of the community goes a long way,” he said. If you or your organisation would like to lay a wreath, please register by sending your request to ceoassist@ chrslgroup.com.au. Only those registered will be announced and called to lay a wreath at the ANZAC. If you would like to lay a wreath and do not registered, then you may do so but you will not be announced. Maximum of two people per wreath.